This railway was the first hydroelectric-powered trolley in the world; it ran along what is now the path for the greenway. In 1885, lumber baron Edwin Carrier moved to West Asheville and purchased 1200 acres. In 1887, he rebuilt the Sulphur Springs Hotel and his West Asheville Improvement Company began laying out streets and building brick buildings along Haywood Road. In 1889, Carrier brought electricity to West Asheville by construction a dam and powerhouse on Hominy Creek. This dam powered a commercial street car, which ran through this property from Asheville to his Sulphur Springs Hotel. This was the first hydroelectric plant and first electric rail in Western North Carolina. The West Asheville and Sulphur Springs Railway formed in April 1891. Operations began in summer of 1891 from the hotel to Depot and in summer of 1892 to downtown Asheville (near what is now Pritchard Park). This railway was the first hydroelectric-powered trolley in the world; it ran along what is now the path for the greenway. In 1892 the constructed a new stone dam and powerhouse downstream from the original dam. The remains are still visible. Tracks from the trolley were remove in 1896 to be used on Waddell’s Biltmore Line. 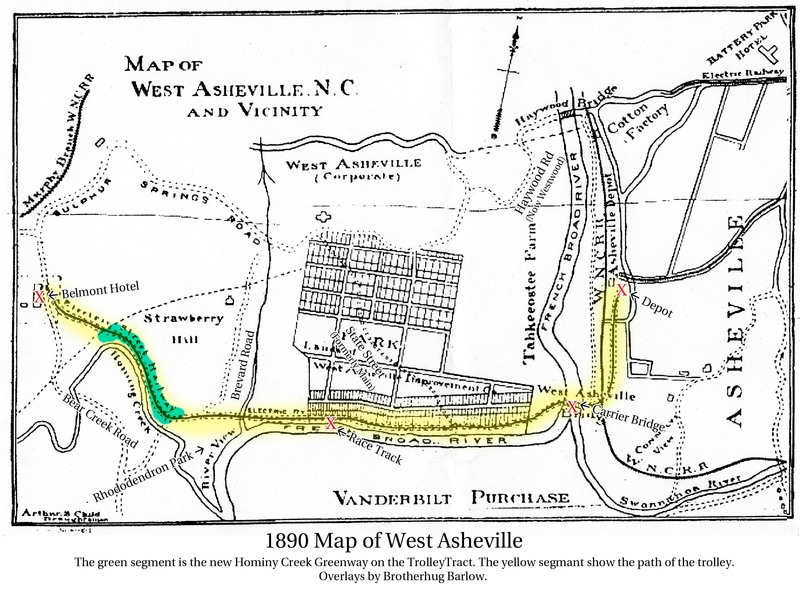 For more information about the West Asheville Streetcar Line, visit the West Asheville History Project. Description of Asheville and West Asheville (which was a separate town) in the December 1890 issue of Country Homes, a magazine published in Asheville by the Tomlinson Brothers. Research and presentation by Brotherhug Barlow.